Magic Bars are also known as Hello Dollys, Coconut Dream Bars, and either a Six or a Seven Layer Bar. This bar is easy to make. The six ingredients to make this delicious Bar are graham cracker crumbs, melted butter, flaked or shredded, sweetened or unsweetened dried coconut, chocolate chips, chopped nuts, and then sweetened condensed milk is poured over the top. 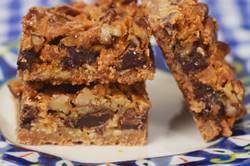 (To make a Seven Layer Bar you add a layer of butterscotch chips.) I guess the "magic" comes in the fact that layers of ingredients, with no mixing, can almost "magically" turn into a cohesive bar. While I must admit they are not much to look at, they are deliciously sweet and gooey with wonderfully crisp edges. Magic Bars taste even better after a day or two in the refrigerator. This is a great recipe to add to your Christmas baking repertoire or to keep them in mind for the next time you need to make something for a bake sale or potluck supper. For this recipe I do combine the graham cracker crumbs and the melted butter to make the first layer. The rest of the ingredients are then simply layered on top of the graham cracker crust. Sweetened condensed milk is what binds all the dry ingredients together in these Magic Bars. It is made from a mixture of whole milk and sugar that has had about 60 percent of its water removed. Its consistency is thick and sticky (like honey) and it is very sweet tasting. It is most often used in baked goods and it takes on a lovely caramel flavor and color when baked. To give you a small bit of history, Condensed Milk was the result of Gail Borden's (1801-1874) determination to invent a milk that could be stored and distributed over long distances. At the time of its invention (1856) milk was not pasteurized so it was difficult to keep it fresh and free of germs. After Borden received a patent on his invention he starting producing condensed milk, but it wasn't until it became standard issue for the troops during the Civil War that it really gained popularity. Magic Bars: Preheat your oven to 350 degrees F (180 degrees C) and place the rack in the center of the oven. Line a 9 inch (23 cm) square baking pan with foil and then butter the foil. Place the graham cracker crumbs in a bowl. Add the melted butter and stir to combine. Press the crumb mixture evenly over the bottom of the prepared pan. Next, sprinkle the coconut over the crumbs. Follow that by sprinkling the chocolate chips and butterscotch chips (if using) over the coconut. Then sprinkle the nuts over the butterscotch chips. Finally, evenly drizzle the sweetened condensed milk over all the ingredients. Do not mix the ingredients together, just layer them. Bake in the preheated oven for about 30 to 35 minutes or until golden brown and set and a toothpick inserted into the middle of the bars comes out clean. Remove from oven and place on a wire rack to cool. Cut into bars. Store in the refrigerator. These bars can be frozen.